NEHU Ph.D. 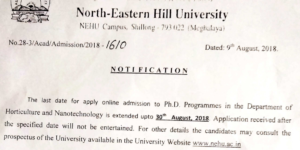 Admission 2018-19: Online Application Extended To August 30 – North Eastern Hill University through a latest official notification on the authorized website has confirmed that Online Application to Ph.D. programmes in the Department of Nanotechnology and in Horticulture is extended till 30th August 2018. This latest news related to NEHU Ph.D. Admission 2018-19 is in continuation with Notification for Admission to Ph.D. & M.Phil programmes in various departments for Academic Session, The last date for online application to M.Ed programme in the Department of Education has been extended upto 8th August 2018 and Revision of fee for all courses/ programmes has been incorporated in the prospectus. Keeping NEHU Ph.D. Admission 2018-19 schedule in mind, on 10th September 2018, Result of Entrance Test for Ph.D. will be disclosed. Besides, on 31 August 2018 and 10th August 2018, Entrance Test for Ph.D. and Result of Entrance Test for LLM will be there. To make payment, students applying for the Courses/Programmes in Shillong as well in Tura Campus are requested to apply online on payment of RS.220/- (Rs.110/- for SC/ST) by visiting this University Website www.nehu.ac.in and the payment will be online using Debit Card/Credit CardlNet Banking through SBIIHDFC Bank. In PDF, Board of the controller of examinations, NEHU University Ph.D. Admission 2018-2019, Merit List for LLB Hons, Masters of Technology ECE, B.Tech ECE Lateral Entry, B.Tech (IT) Lateral Entry, B.Tech Biomedical Lateral Entry and B.Tech Biomedical Engineering. Moreover, Entrance Test for BA LLB (Hons), Result of Entrance Test for BA LLB (Hons) and Entrance Test for LLM will be 27th June 2018, 4th July 2018 and 7th August 2018 respectively. Steps to apply online and all details related to Application Form and fees are already mentioned on ALLINDIAROUNDUP, in case, candidates can also contact helpdesk viz. Email to [email protected] and Phone Number 272-4000, 272-5000.